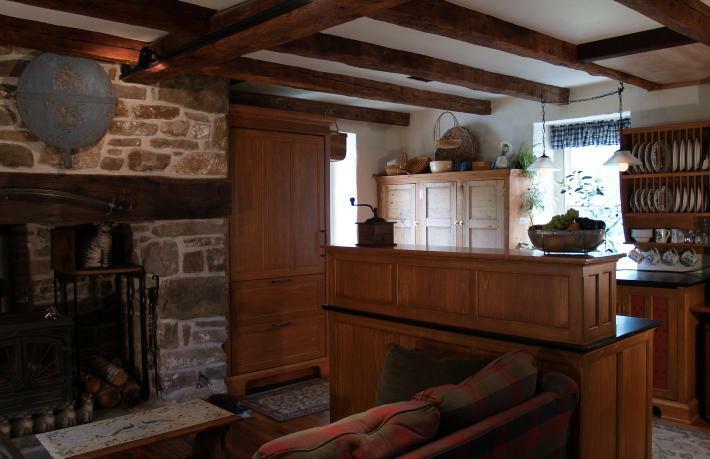 Unpretentious elegance characterizes this renovated 19th C. Pennsylvania German stone farmhouse Keeping Room Kitchen that features an original stone fireplace that is the focal point of the room that includes the kitchen, dining area, seating area (in front of a fireplace) and a desk. A freestanding antique pine cupboard shown in the corner provided the model for the other unfitted workstations. YesterTec’s unfitted furniture pieces conceal a Subzero 700 36″ wide refrigerator/freezer that is de-emphasized in an armoire that is recessed back from the fireplace. Two other YesterTec freestanding pieces help conceal the “tech” look of kitchen appliances from view from the remainder of the room. The plate rack utilizes the only wall space available to display the everyday dishes. What is a Keeping Room anyway? Meridith Ingram of Home magazine online in 2001 wrote “The concept of a keeping room dates back to Colonial times. In those days, the keeping room was located directly off the kitchen, which, because of the stove, was also the warmest room in the house. By day, families gathered here to do indoor chores—cooking prep, mending, laundry and the like—and by night would sleep there during the colder seasons. Here too they’d often have the last meal of the day. So what is a modern day keeping room? But of course, it is a lot more than that, but mostly, it should be a very comfortable, cozy room that combines kitchen functions, eating, lounging, and the many other multi-task functions of everyday living. Like a family room or great room, the Keeping room just needs to have a more intimate feel. 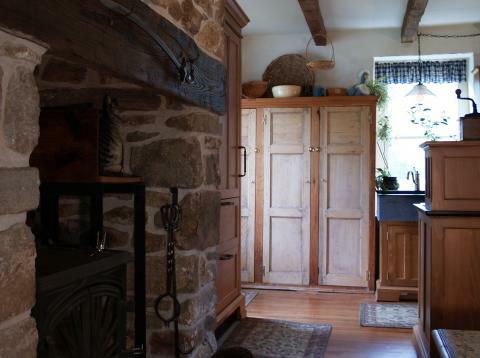 In that respect, this Keeping Room excels, not just because of the Workstations, but the room’s bones, the low ceiling, a gorgeous stone hearth, wood floor, deep window sills due to the stone construction and the old ceiling beams all add character that is hard (and expensive) to mimic with new construction. Please click here for more information and images about this unfitted ‘Keeping Room’ kitchen.